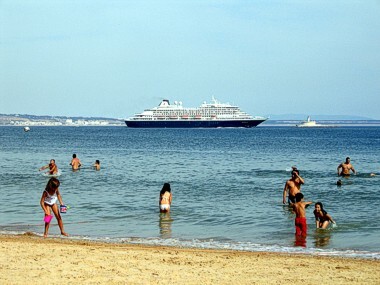 Thanks to the 'Linha de Cascais' (name of the train line joining Lisbon to Cascais), and the 'Marginal' (name of the scenic seaside road linking Cascais, Estoril and Oeiras to centre of Lisbon), nearly all the beaches are easily accessible by public or private transport. Several stops and accesses link these suburbs to each other through a 'Paredão': a scenic walk path illuminated at night featuring public benches, bars, exercise stations, etc. Most of them are watched by a security team during the summer season and feature snack bars, restaurants, public toilets, showers and changing rooms. Stops and views along this route are varied and so different from each other that one will surely find his or her perfect spot along the way. 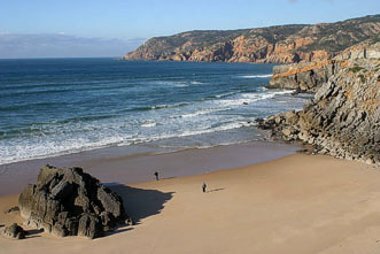 Located in a small bay with a rock formation in the middle, at the north of the Guincho beach. Calm and sheltered from the wind. Access is via stairs set in the rocks. The beach is 100 meters wide and features a restaurant on top of the cliff. The nearest bus stop is at the Guincho beach, quite some distance away. Access by car is via an uneven non asphalted road. The beach is watched during the summer season. 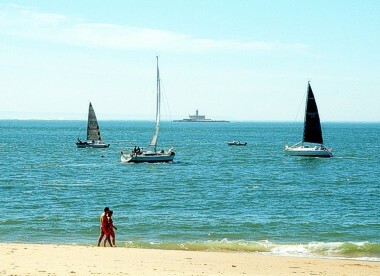 One of the largest beaches of Lisbon coast with an 800 metres sea shore. Being quite exposed, it features strong winds and big waves, making it a major venue for the European and World Surfing and Windsurfing Championships as well as many other competitions. It is an ideal location for surf, windsurf, bodyboard and kitesurf, however, due to its frequent strong waves, it is not recommended for casual swimmers. Many excellent fish and seafood restaurants can be found nearby as well as bars, a windsurf school, sun-shade rentals, public showers and toilets. Facilities for disabled. The 'Estalagem Muchaxo' Map Inn overlooks the beach. There is a bus stop in front of the beach and several parkings close by. 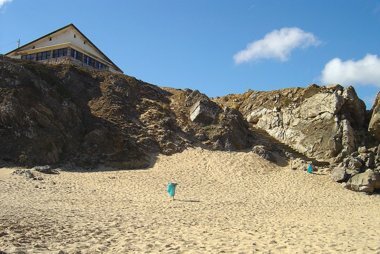 The beach is watched during the summer season and features a first aid point. Located in a small inlet, Cresmina beach is a small (330 metres) sandy strand enclosed by rocky cliffs. 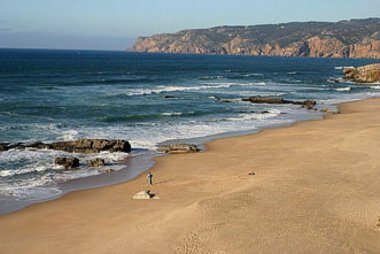 Similarily to its neighbour Guincho, it is not recommended for casual swimmers. Several restaurants and bars, public showers and toilets. Facilities for disabled. There is a bus stop nearby and several parkings. The beach is watched during the summer season and features a first aid. 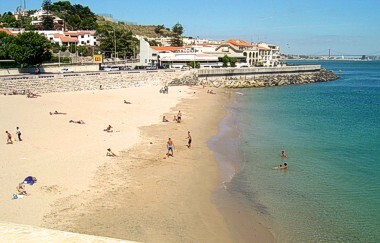 Santa Marta beach is located at the back of the Castro Guimarães museum. 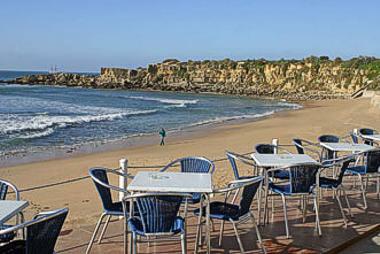 This tiny beach features a bar restaurant and enjoys all the facilities (shops, restaurants, supermarket, ...) provided by the Cascais' Marina, 250 metres away. The renowned 'Coconuts' discotheque is one of the largest in the area and can be found 110 metres away. Right in the middle of the town of Cascais, infront of the Baia Hotel Map and the Seixas palace (Portuguese Navy officers club), Ribeira beach enjoys all the facilities of a beach in the middle of a town: bars, restaurants, shops, train and bus stations, parkings, services and even the town house are only a few minutes walk away. 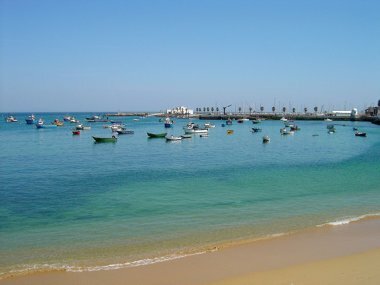 The beach is also most commonly known as the Fishermen's beach ('Praia dos Pescadores') due to its proximity to the fish market, several small fishing boats dock the pier in the morning and are anchored in front of the beach during the day before departing at night. 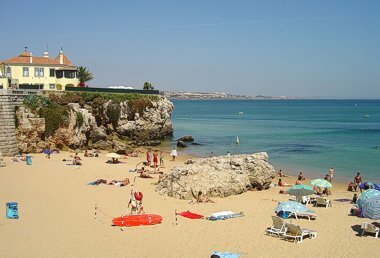 A tiny 50 metres wide beach in the centre of Cascais, circled by cliffs, a few metres away from the Cascais' train station and all town facilities such as the Pergola guest house Map 200 metres away. 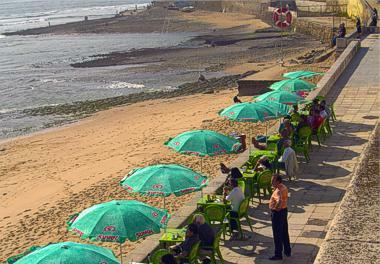 An esplanade with a snack bar overlooks the beach and the Albatroz Hotel Map borders it on the west. It owes its name to the queen ('Rainha') Dona Amelia (1865-1951), the last queen of Portugal, who favoured it for her baths during the summer. 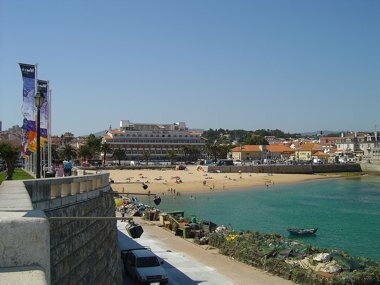 Conceição beach, located between the 'Chalet Faial', former Cascais Court of Justice building, and 'Nossa Senhora da Conceição' chapel (after which she has been named), adjacent to the 'Duquesa' beach, it is accessed from the promenade (paredão), through a ramp and staircases. Several Bars and small restaurants around the beach. 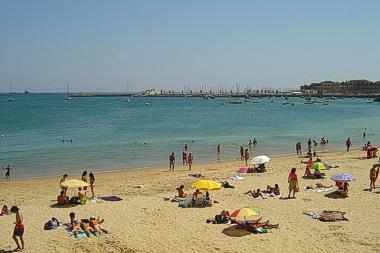 The nearest bus stop is at the Cascais train station (5 minutes walk). 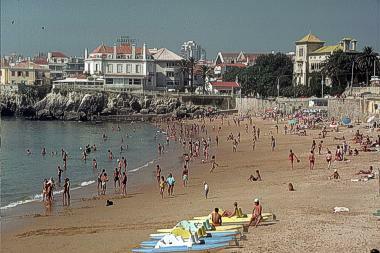 The 'Duquesa' (Duchess) beach is located between the 'Palacio do Duque de Palmela' (Duke of Palmela palace) - today the Albatroz Hotel Map - and the 'Faial Chalet' (former Cascais Court of Justice building). 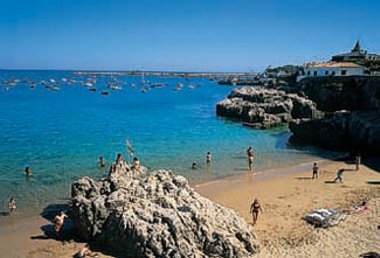 Its name is due to the fact that this little beach was frequently visited by the Duchess of Palmela, when Cascais was among the King's favourite seaside resort and along with him came the court and the aristocracy. 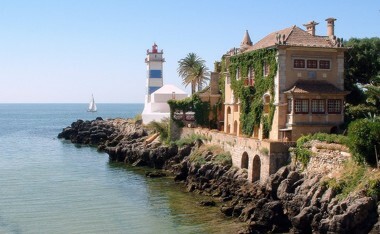 Portuguese Royalty and many exiled Monarchs have lived in Cascais over the years. 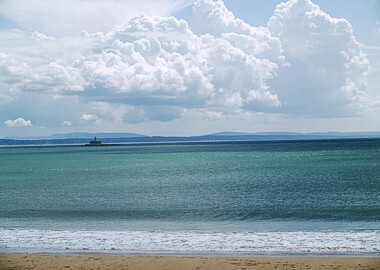 The beach features umbrellas, small pedal-boats for rent and a diving school. 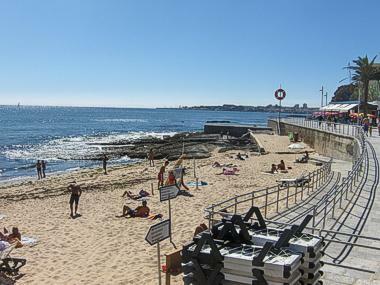 Access to the beach is easy from the promenade along Estoril's 'Paredão'. Several bars and restaurants nearby. Facilities for the disabled are available such as access ramps. The beach is watched during the summer by lifeguards. Parking available nearby with parking meters. 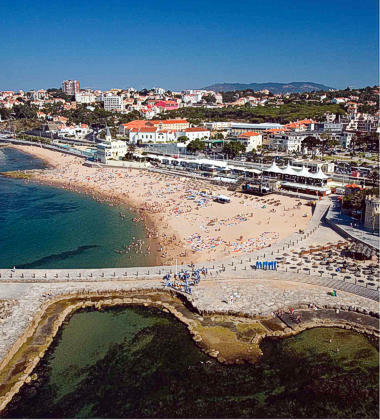 Located between the 'Duquesa' and 'Tamariz' beaches, Moitas beach is bordered by the costal promenade linking Estoril to Cascais with a direct access to the 'Monte Estoril' train station. (The journey to Lisbon's 'Cais de Sodré' central train station takes 30 minutes). The closest accomodation resource is the Estoril Eden Suites Hotel Map, 300 metres away. In addition to its little bars, restaurants and shops, it has a spacious seawater swimming pool. Located just in front of the Casino of Estoril gardens, behind the Estoril train station and the tourism office, the 190 metres long Tamariz beach, is easily reachable by train or by car and also has good pedestrian accesses. The beach has several facilities such as restaurants, bars, clubs, shops and discotheques as well as an ocean swimming pool next to the promenade (Paredão) and is equipped with toilets, showers and facilities for disabled persons. In terms of accommodation, less than 400 metres away, one can find the : S. Mamede Hotel (2*) Map , Inglaterra Hotel (4*) Map and the Palacio Estoril (5*) Map. Sun shelters, parasols, and beds as well as pedal-boats are rentable. Parking might be rather crowded during the high season. The beach is watched during the summer. 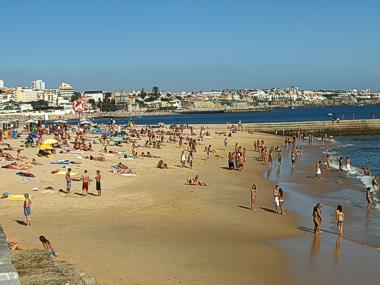 This small (160 metres wide) beach situated in São João do Estoril can be accessed from the Tamariz beach on the west, and from the Azarujinha beach on the east through the promenade 'Paredão'. 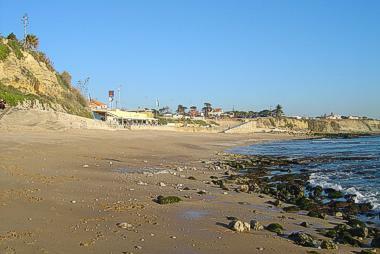 A pedestrian tunnel (beneath the 'Marginal' road and the train railway) links the beach to the valley of 'Santa Rita'. There is also a free car parking nearby along the 'Marginal' seaside road. Overhanging the beach is a fortress which has been converted into a discotheque (the 'Forte Velho'). Sun shelters, parasols, and beds are available, there are also a few restaurants on the west end of the beach. East of Poça beach, the tiny beautiful Azarujinha cove (45 metres wide), surrounded by cliffs, is only accessible through the pedestrian promenade coming from Cascais through Estoril and at its east end via stiff steps directly leading to the 'Marques Leal' avenue in São João do Estoril. The nearest train station is 260 metres away. 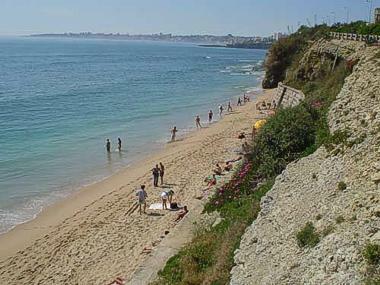 Sao Pedro beach, sheltered by a cliff, is located in a semi urban area between Lisbon and Cascais. The beach is accessible to pedestrians by staircases or a tunnel beneath the road and is well known for its skim board surfers. 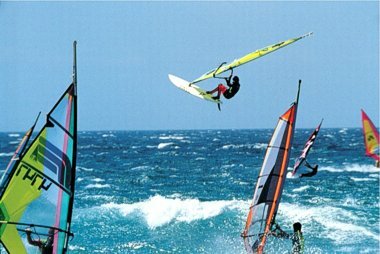 It is equipped with restaurants, bars and a windsurf school. There is a car parking close by and the train station of São Pedro do Estoril is reachable through a tunnel. 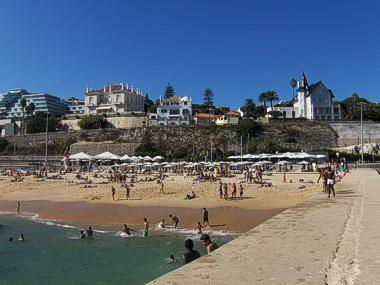 Bafureira beach, which is 160 metres wide, is one of the smallest beaches of Cascais. 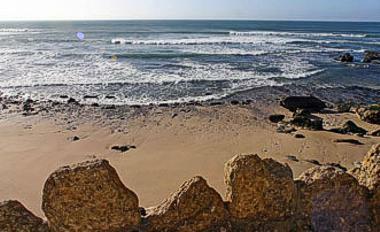 It is separated from São Pedro beach by a large rock formation and is surrounded by cliffs. 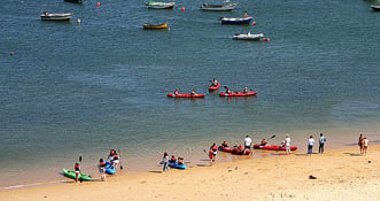 Parking is is shared with Sao Pedro beach, along the 'Marginal' seaside road. 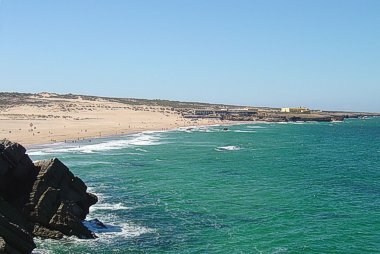 The beach is accessible through a steep stairway that begins at the parking or can also be accessed through a narrow passage along the ocean from São Pedro beach. 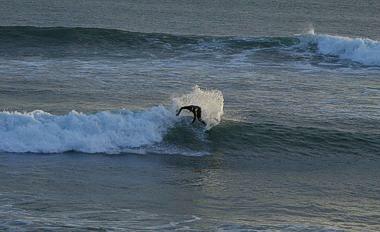 The beach is frequented by surfers and is equipped with toilets and showers. 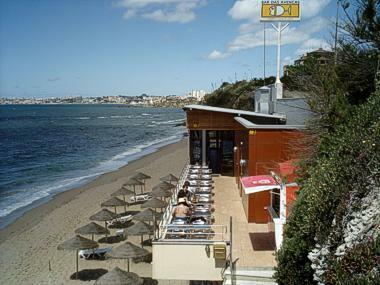 A a bar-restaurant, which operates as a discoteque at night, is located on the beach. 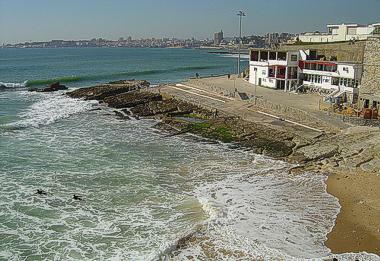 Nearest train station is at São Pedro do Estoril, 700 metres away. 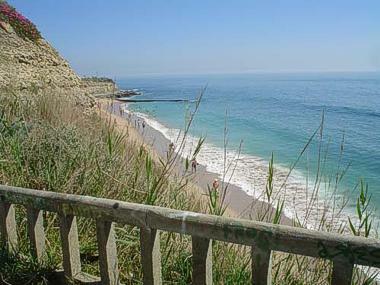 The narrow Avencas beach, 260 metres wide, surrounded and protected by cliffs is remarkable by its fauna and maritime flora. 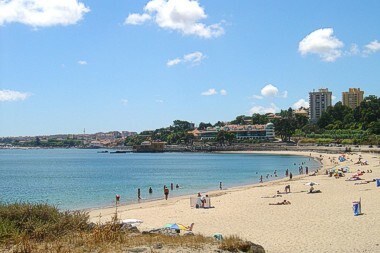 It is located between Sao Pedro do Estoril and Parede. There are no parking facilities at the beach, so that its easiest access is through a pedestrian tunnel under the 'Marginal' road, which links the beach to a small car park on the other side. The other access is is made trough a stairway, from the Marginal, directly to the beach. The beach has a bar, toilets and is watched during the summer. The Parede train station is 410 metres away. Parede beach, which is 131 metres wide, has always been famous for the therapeutic characteristics of its waters (rich in iodine), good for bone ailments. It is a small beach with a small area of sand and a lot of rocks. 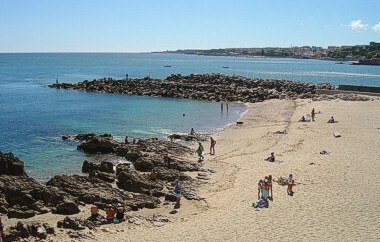 Its small size and the numerous rocks are due to the fact that the beach has been reduced in the 1940s, to allow the construction of the 'Marginal', the seaside road connecting Lisbon to Cascais. Nowadays, good spots on its rocks are prized, due to their excellent exposure to the sun as well as the wind protection they offer. The beach has various esplanades where visitors can find several bars and restaurants. 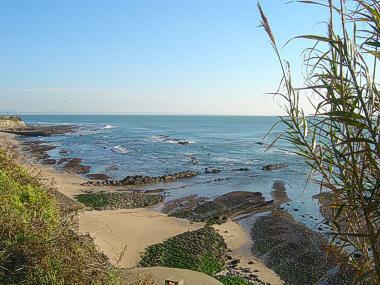 Despite the fact that this beach is isolated from the others, it is easily accessible through three tunnels under the 'Marginal' road, or from its two small car park areas. There are sun shelters and beds for rent. The beach is equipped with toilets, showers, a small tourism kiosk and is watched during the summer. The Parede train station is 650 metres away. 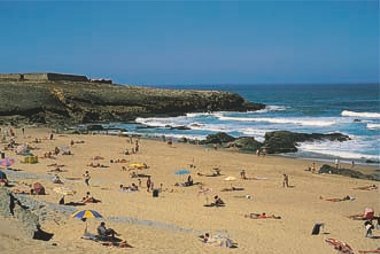 Next to the imposing fortress St. Julian of Barra, with a sand line of 1,350 metres, and good accesses, Carcavelos beach attracts many bathers in summer. Many restaurants and bars surround the beach. 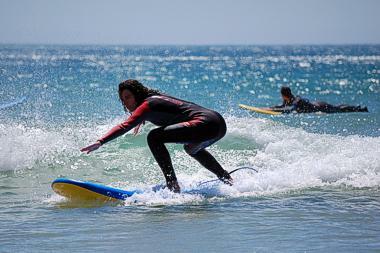 The beach hosts surfers all year round. There is a skate half pipe, basketball pitch and volleyball net. One can find shelters and beds for rent on the beach, which is also equipped with toilets, showers, disabled facilities, a tourism kiosk, a surf and windsurf school, and is watched during the summer. Many car parkings around. The nearest train station is at Carcavelos, 720 metres away. The closest accommodation resource is at 340 metres: the Riviera Hotel Map. 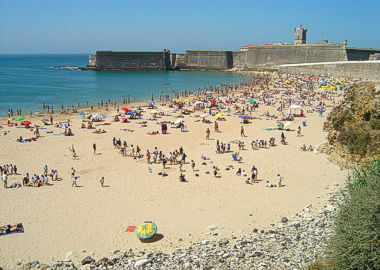 This small beach is separated from the Carcavelos beach by the São Julião da Barra fortress on the west and bordered by the Marina of Oeiras on his east. It is wind-sheltered by its low cliffs. An esplanade overlooking the beach features restaurants and bars. It has showers and toilets facilities. 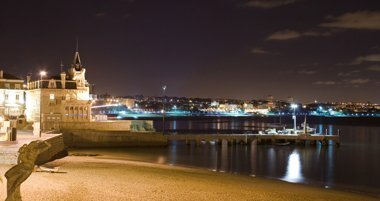 There is a pedestrian seaside promenade that goes up to the São João dos Maias fort at the end of the Santo Amaro beach. On the beach one can find volleyball structures, sun shelters and beds for rent during the summer. Car-parking facilities nearby. Access for disabled available. 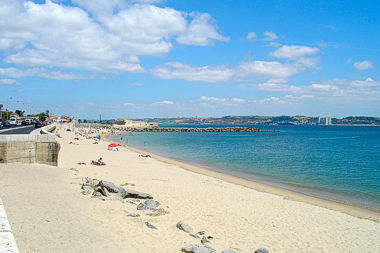 The Santo Amaro de Oeiras beach is one of the closest beaches to the city of Lisbon, at the mouth of the Tagus River. The beach has a couple of snack bars. The Municipal garden of Oeiras is situated in front of the beach, on the other side of the 'Marginal' road that joins Lisbon to Cascais. 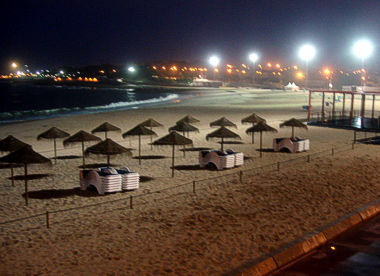 It is illuminated at night and hosts beach volley and beach football tournaments. It has showers and toilets facilities and is watched during the summer. The nearest train station is 300 metres away. 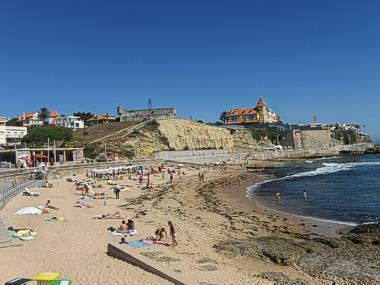 Also known as 'Praia Nova' (new beach), it is 240 metres wide and is frequented by surfers during the summer. The beach is equipped with bar, telephone, restaurant, volleyball and football beach structures, showers, toilets and is watched during the summer. It is accessible by car, bus or train, but there are no parking facilities close by. The nearest train station is 1,000 metres away. 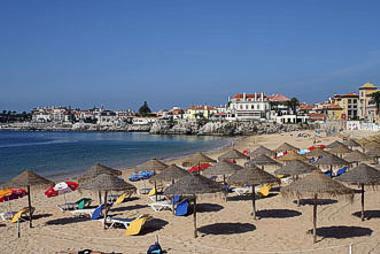 Caxias beach lies along the 'Marginal' road that joins Lisbon to Cascais. 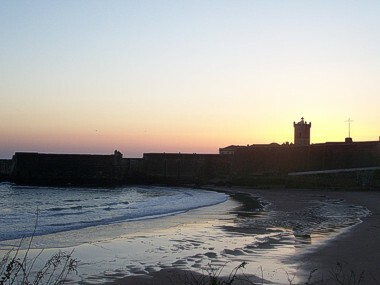 Located next to the São Bruno fortress, at the mouth of the River Tagus which empties into the Atlantic Ocean, Caxias beach, despite its privileged location close to the city is a quiet spot, replete of natural beauty compared to relatively better known more crowded beaches in the area. 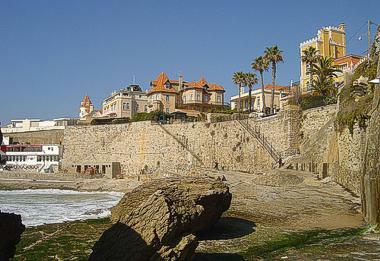 It has a cafe restaurant, next to the fortress, which is accessible through a little bridge across the Barcarena river. The best way to access this beach is by train, stopping at the Caxias train station, on the other side of the 'Marginal' road. It is not really a beach but the 'Ocean' pool at the Oeiras Marina, next to the Torre beach, should be included in your list.